OceanicDreams: A Bit of Personal History: My Old Man as a Young Man, and Where he Came from. A Bit of Personal History: My Old Man as a Young Man, and Where he Came from. Thanks to the Internet I was able to get a hold of this photograph of my father, Wolfgang Leander (1905-1964), when he was 28 years old. At that time (1934), he was the test pilot and chief pilot of the Fieseler aircraft factory in Kassel. What is interesting about this image is the incredibly sleek design of the Fieseler Fi-5, a light training and aerobatic plane that was quite well known in Germany; however, it was not as hugely popular as the legendary Fieseler "Storch" that was developed in 1936, and was the first aircraft in the world to boast a stunning STOL performance. Wolfgang Leander at an air show in Kassel demonstrating the remarkable features of the Fieseler Fi-97 which was the previous model of the famous Fieseler "Storch". The plane is flying horizontally on this 'tilted' position at its lowest speed: 58 kmh. 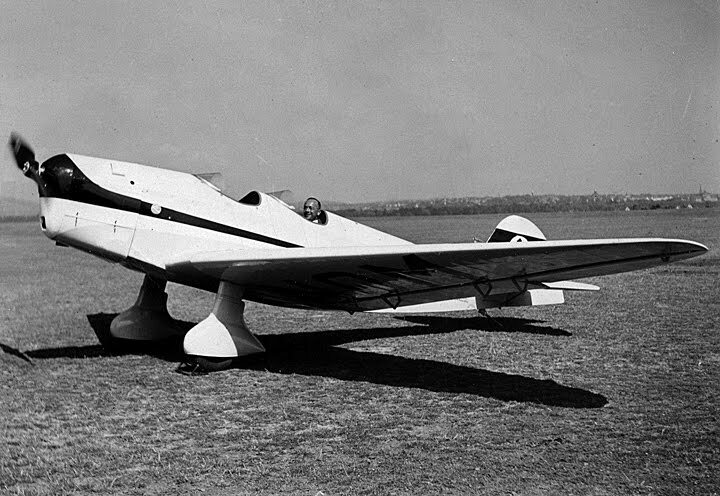 The owner of Fieseler Flugzeugbau, Gerhard Fieseler, became an international celebrity as the first aerobatic world champion. The historic championship, during which two contestants crashed and died, took place in June 1934 in Paris. My father was a member of the international jury, and represented Germany at this spectacular event - being the only Jew in the German aviation world at that time....! During 1934 most German Jews had already lost their jobs and were being subjected to the ever increasing state sponsored anti-semitic terror. As a pilot, Gerhard Fieseler must have held my father in the highest esteem. In a reference letter, Fieseler described my father's flying skills as being "outstanding and far above average". In 1936, Fieseler, by then a member of the Nazi party, was either forced by more radical Nazis, or was himself convinced, to finally get rid of his Jewish chief pilot which was when my old, still young man decided to leave Germany. 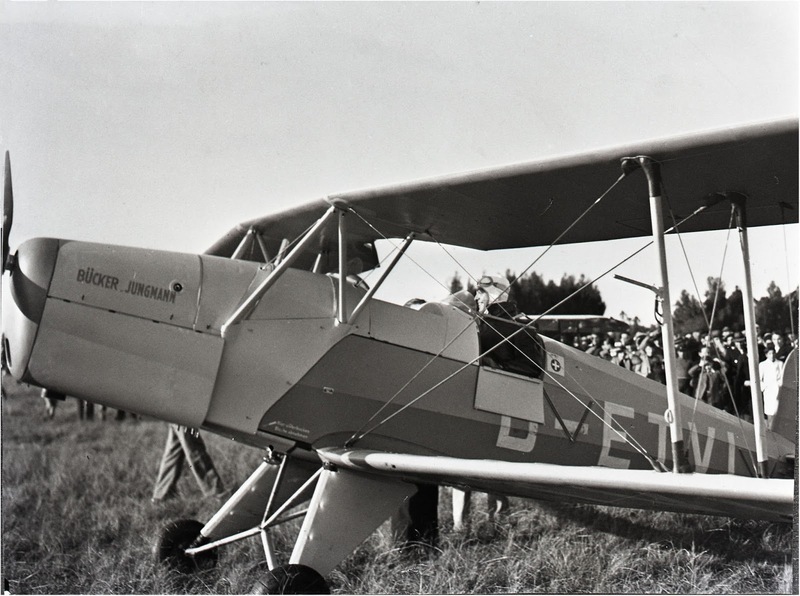 Due to his excellent contacts in the aviation circles, my father was lucky to have been engaged by the "Reichsverband der Deutschen Luftfahrtindustrie" (= "Imperial Association of the German Aircraft Industry") to represent the interests of some of their members, such as Focke Wulf, Arado, and Buecker in Brazil, Argentina, Uruguay, and Bolivia. His place of residence would be one of the most beautiful cities in the world: Rio de Janeiro. Wolfgang Leander after an aerobatic show with a 80 hp Buecker "Jungmann" in Rio de Janeiro, 1936. 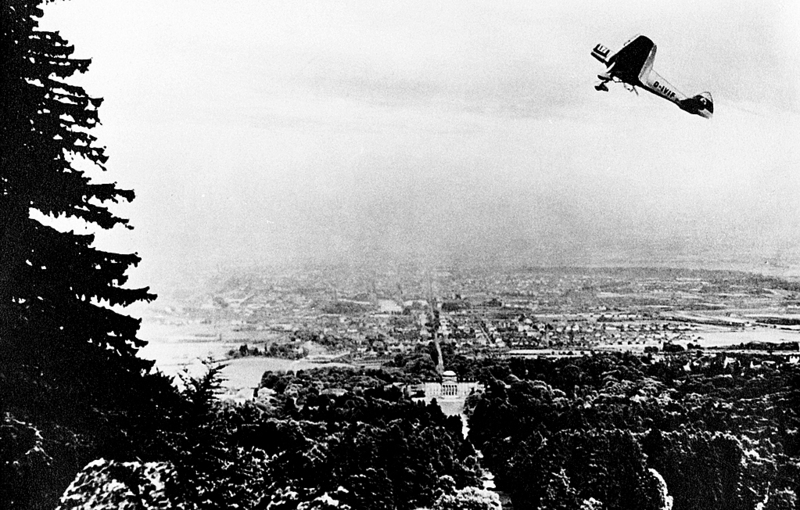 He was one of the very few pilots who could fly an inverted loop with this biplane. Thus, in June 1936 Wolfgang Leander set off to Brazil with a work contract in his pocket and all of his belongings, among them a brand new BMW 328. I don't know of another German Jew to have been so privileged in the early years of the Hitler regime. At this point I believe I need to digress or else elaborate on my father's history which, in a way, mirrors an interesting, albeit rather disturbing aspect of the German-Jewish history. My father's family could trace back their Berlin-Jewish roots to 1684 when one of their direct ancestors was given the right to settle in Berlin according to the then existing quotas allocated to "foreign" Jews. Needles to say, such settlement rights could not be acquired unless the applicants were willing and able to pay a hefty settlement tax. My father's forebears belonged, accordingly, to the oldest and relatively well-to-do Jewish families in Berlin. When the Prussian Jews were emancipated and required to take on permanent family names (1812), Samuel Liebmann Alexander (1768 - 1830) - my great-great-great grandfather - chose to be officially named Leopold Leander. Like many, if not most, German Jews our ancestors embraced German culture with a passion and fervor that was "typically Jewish" or "Jeckish", as Israelis would later label that nostalgic and almost unconditional love for all things German displayed by most immigrants from Germany. My great-great grandfather Heinrich Lode (1812 - ?) was one of the first Berlin Jews to be admitted to the university where he studied medicine and became a registered medical doctor. That generation, open-minded and eager to discover exciting new horizons beyond the narrow confinement of a century old ghetto reality, felt quite comfortable in the reformed branch of Judaism, a liberal, much less rigid congregation than the conservative or orthodox ones. Most assimilated German Jews who did not want to sever the ties from their traditional communities altogether chose to identify themselves as Reform Jews. Others converted to the Christian faith, believing that a full blown conversion would make them 'non-Jewish'. They were tragically wrong. At that time - we are looking at the last two to three decades of the 19th century - anti-semitism was based on racial theories, not on religion. Rightist German students chanted: "Der Glaube ist uns einerlei; in der Rasse liegt die Schweinerei!" (= "We don't care about the faith; it's the filthy race that we find abhorrent!"). Racial Jew-hatred became much en vogue after some dubious scholars published their pseudo-scientific findings, among them a French count, Gobineau, and Houston Stewart Chamberlain, a British political philosopher and a notorious racist who believed in the supremacy of the teutonic "race". Chamberlain was the son-in-law of Richard Wagner, himself viciously anti-semitic, as is well documented. Jumping to the early 20th century, my grandfather Alexander Leander (1871 - 1932), a lawyer with a doctorate degree, holder of the title 'Koeniglicher Justizrat' (Royal Legal Counsel), and an author / editor of several specialized law books, served in the Imperial Army as an interpreter for Greek during World War I (he was proficient in six languages including old Greek and Latin). Alexander represented what was then coined a "Bildungsbuerger", a member of the educated class, completely at home in the traditionally classic humanities and the German Enlightment. He was a confirmed monarchist, and as such he deeply resented Germany's transition into a democracy under the leadership of a socialist president of humble origin (Friedrich Ebert). My father Wolfgang, politically conservative, experienced three political systems: The German monarchy as a boy; the Weimar democracy as an adolescent, and the early Third Reich in his late twenties. While he still went to a 'Gymnasium' (= high school with the emphasis on humanities), his heroes were the German pioneer pilots, especially the German WW I aces such as von Richthofen (the "Red Baron"), Boelkow, Immelmann, Udet. As a freshly enrolled student at the Technical University in Berlin my dad became a member of the Berlin chapter of the Akademische Fliegergruppe ("Akaflieg"), where his initiation into the world of fliers consisted of hard work building glider planes in his spare time. Only one year later, after having successfully built a plane with his comrades, could he take up flying lessons as early as in 1923 - to graduate the same year from the Glider School at the Wasserkuppe where most of the better known German aviators made their debuts as daring pilots. Wolfgang Leander left Germany only after he and aviation friends of his had to realize that the Nazis were serious about solving what they called the "Jewish Question". The determination of the Germans to expel the Jews from their society the became a stark reality when the infamous Nuremberg Racial Laws were introduced in 1935. Still, neither my father nor even pessimistic contemporaries, Jewish and non-Jewish, could imagine how the barbaric Jew-hatred and the exclusionary policies of the Hitler regime would develop only a few years later, when Hermann Goering, a veteran aviator and fighter ace of WW1, would order SS-General Reinhard Heydrich, known as the "Blonde Beast" among his peers, to draw up a master plan for a "Final Solution" of the Jewish Question. Many German Jews put their trust into the "other" Germany - the Germany of Goethe, Schiller, Lessing, Herder, the philosophers, the composers who have so much enriched German cultural life, and shaped the country's identity as one of the most civilized modern nations. As we painfully know today, history proved these naive, patriotic German Jews completely wrong: Their fate in the "new" Germany, the Third Reich, lay in the hands of the implacable 'Masters of Death': Heydrich, Himmler, Eichmann, and all those almost anonymous hundreds of thousands of Hitler's 'willing executioners'. 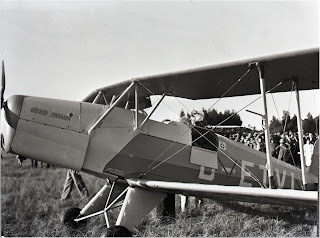 After working as a representative of two important German airplane manufacturers (Focke Wulf and Buecker) for almost one year out of Rio de Janeiro, my dad eventually settled in Bolivia in 1937 when he was invited to join the local airline, Lloyd Aereo Boliviano, as a commercial pilot. The Lloyd Aereo Boliviano had a strong German element in its beginnings: The company was founded in 1925 by progressive German residents in Bolivia; the fleet consisted mostly of Junkers aircraft (F-13, W-34, Ju-86, and the famous Ju-52); the General Manager and chief pilot, Hermann Schroth, was a German aviation pioneer (he was the first one to cross the Mediterranean Sea by air); technical support was given by the Dessau-based Junkers company; the majority of pilots and mechanics were Germans. "El Lloyd", as the airline was commonly called in Bolivia, was associated with the Deutsche Lufthansa through its Brazilian subsidiary, the 'Sindicato Condor', to be in a position to offer their passengers connecting flights to the major cities in Brazil. Labels: Airplanes, Gerhard Fieseler, Wolfgang Leander sr.
Priceless photograph and wonderful story! That grin is indeed a Leander trade mark!